It's amazing to think about how much our trips have changed over just the past decade thanks to technology. Packing has become easier because we're now able to fit all of our entertainment into one small device. No more heavy books, portable DVD players, Walkman devices, or anything else that would take up precious carry-on space. Phones, tablets, and ever-shrinking laptops make traveling more enjoyable. For many airlines, inflight WiFi is available making our own technology even more useful during our trip. While personal tech has been a savior for many travelers on long trips or layovers (as long as there's a way to charge their devices), it has improved the entire journey in so many ways – more than just for entertainment. During a traveler's journey – especially if they're flying – there are multiple points where technology can improve the experience. The boarding pass process has almost gone completely digital for many passengers. 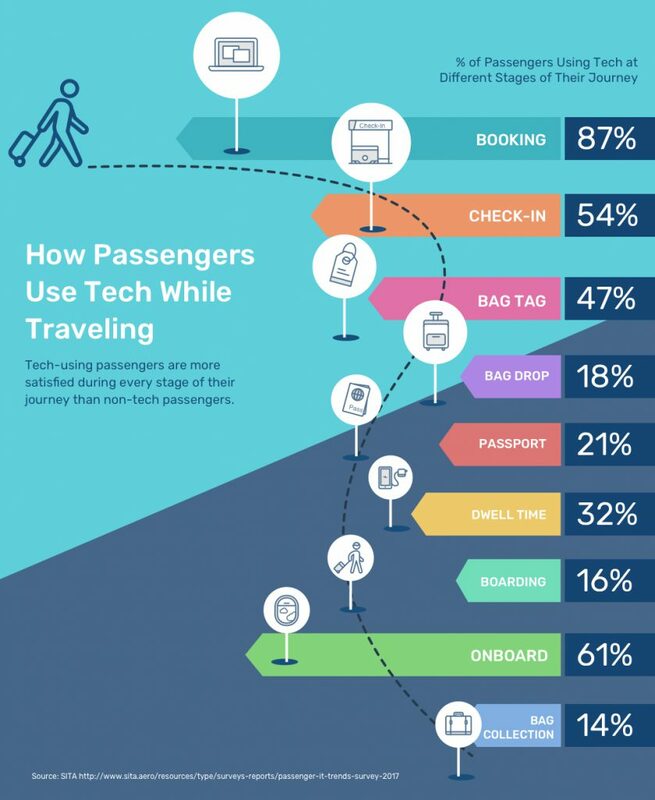 Almost 90% are booking their tickets through self-serve technologies and from there there are so many ways to keep the process digital from checking in online, using a digital boarding pass, and even using technology for bag drop. However, not all travelers have adopted technology during all stages of their journey. Many still rely on airport, flight, or other staff to help them get from point A to point B. Depending on the stage of the journey, technology use fluctuates. Maybe it's because technology can't replace the trust and satisfaction that another human can provide (I'd personally rather check my bags with an attendant than trusting myself to do it correctly). Maybe it's because technology just isn't available for certain aspects (will the future give us robots instead of flight attendants?! Hopefully not...).